२-१ ॐ – This is a single letter, a sound to be pronounced as a sacred invocation. More about this in notes below. Because it is an invocation by itself, it is not part of any sentence. ४-१ श्री-परम-आत्मने (मम) नमः (अस्तु) । = May my obeisance be to the only, ultimate, fundamental, splendorous principle (soul, essence) ! ५-१ ॐ श्रीपरमात्मने नमः This quotation is the opening prayer or obeisance. It is a good concept to open any composition with a prayer. That inculcates a sense of modesty, not only for the composer, but also for the reader. In this quotation, ॐ is not part of the sentence. It is a stand-alone entity. Hence it merits to be discussed all by itself. It is held in high respects, because its mere utterance spreads an aura, a great positive charge in the environment. Meaning is – ॐ and अथ were the two (sounds or syllables) which emerged from the throat of Brahma (first and foremost, when Brahma embarked upon creating the cosmos). Hence both are sacred. We shall of course study this in due course. We shall study this also in due course. ५-४ People have written wholesome articles explaining this sacred syllable ॐ. ‘म्’ ‘m’ as in hum. One can see the Omkaara as the meditating pose of Lord ganesh, if one looks at Om turned 90 degrees to the left i.e. anti-clockwise. 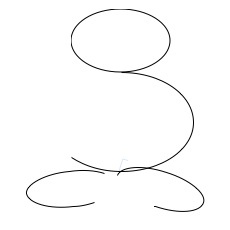 By this part of अ can be seen as two laps, part of उ as the prominent belly and the trunk portion of ॐ as the circular head or face. ५-५ Most tasks are undertaken by invoking some deity or the other. Here, श्रीमद्भगवद्गीता starts with ॐ श्रीपरमात्मने नमः i.e. by paying respects, obeisances to the only, ultimate, fundamental, splendorous principle (soul or essence) ! ५-७ परमः is an adjective meaning supreme, ultimate. परमः is also used to denote the superlative degree of the adjective पर. Here it is the adjective qualifying the noun आत्मा. परमात्मा connotes supreme, ultimate soul. ५-८ आत्मा means soul. Characteristics of soul, that it is indelible, cannot be wetted, cannot be burnt, cannot be cut are all detailed in second Adhyaaya. आत्मा is elemental soul and परमात्मा is supreme, ultimate soul. Any supreme entity merits to be deified. ५-९ Once when I was sitting with a German friend in an open ground, a few rain-drops came down. I suspected that soon it may become at least a drizzle, if not a shower. So, I just muttered, “Now, it seems that the rain God also does not want us to linger.” My German friend said, “Hey! You said ‘rain God’? Would you call the Sun also as God?” I said, “Yes, sun is the supreme source of energy. Being supreme it is a deity. It is God”. Then he asked, “How about the wind, the earth, nature at large?” I said, “Every element of nature is God. Deifying any entity is respecting its supremacy. Look at the ravaging caused by the hurricanes in US and what unsurmountable energy becomes manifest when hurricanes ravage vast tracts of land and life. Supremacy does not come only by being too huge. Even an ant, if it bites into the ear of an elephant, the ant is exercising a supremacy over the elephant! Meditation is facilitated by having a mantra to chant. Even ‘ॐ’ by itself is a monosyllabic mantra. This word ‘Mantra’ also merits discussion. We shall come to it at 09-16. At the southern tip of India, near Kanyakumari, off the seashore, there is a small island dedicated to the memory of Swamy Vivekanand, hence called as ‘Vivekanand Shilaa’. It is said that Swamy Vivekanand did meditation there, before he embarked upon his famous journey to America to represent Hinduism at the World Parliament of Religions held in 1893 in Chicago. “He went, he spoke, he conquered!! !” At Vivekanand Shilaa, there is a meditation hall. There at the hall, all light is put off and on the wall in front, a figure of Om glows with a pleasant azure blue halo. It becomes such a rich experience of Omkaar-Dhyaana, meditating on the monosyllabic mantra ‘ॐ’ !!! ५-१० It is a rule of Sanskrit grammar that the word नमः should be used with dative case चतुर्थी विभक्तिः of the deity or concept to whom obeisance is being paid.